A record number of women are now New York City firefighters, with four new women set to complete the punishing probationary period and testing to graduate on Friday. They include a single mom, a former Marine, an electrician, and a woman who trained alongside her two brothers. And now for the depressing part: with the four new graduates, the FDNY has a total of 49 women, or less than 0.5 percent of the 11,000-person department. 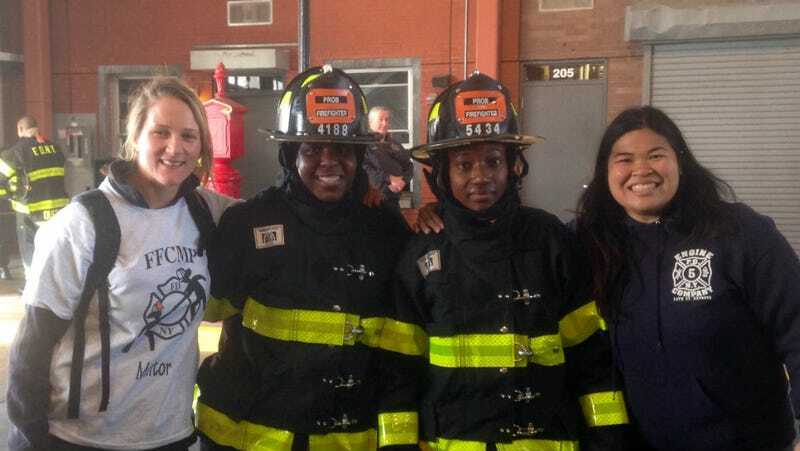 The United Women Firefighters, a FDNY group, sent out a press release today to announce that the four women will graduate from the training academy. The UWF advocates for women in the FDNY and runs physical fitness trainings to help aspiring female firefighters pass the tests. The UWF has said that hazing from FDNY instructors and their fellow firefighters, as well as unfair testing practices, are keeping women from joining or remaining in the FDNY. But UWF president Sarinya Srisakul, who’s been a firefighter for more than a decade, told Jezebel she’s seeing signs of real progress this year. All four women who began training at the fire academy as probationary firefighters finished the program and did extremely well on the physical fitness tests, she said. In past years, at least a few women would be forced to drop out midway. For years, the UWF’s biggest opponents were an FDNY group called Merit Matters, which decried “affirmative action” in the department and claimed that Black and female firefighters were getting preferential treatment. Earlier this year, Merit Matters’ president Paul Mannix, a Deputy Chief in the FDNY, was fined by the department for allegedly leaking confidential information about women and minority firefighters. That information included their test scores at the academy, medical records, and other evaluations. Mannix was docked 50 days’ pay; other FDNY fighters responded by complaining that he was being persecuted and raising around $41,500 in a GoFundMe account for him. He wasn’t able to accept the money, however, because civil service rules say it’s illegal to profit from your job or uniform. In July, under pressure from the department brass, Mannnix announced he would voluntarily disband the group. FDNY employees are also soon going to be asked to undergo diversity training, although both the UWF and the Vulcan Society, a Black firefighters group, has said they were only able to give the most minimal input on what the training would involve. The FDNY remained 89 percent white as of last year. New FDNY graduates Choeurlyne Doirin and Aleigha Powder, center, with UWF President Sarinya Srisakul, right, and Daiana Mielnik, another firefighter, left. Image courtesy Sarinya Srisakul.